Researchers at the University of California, Santa Cruz, are leading a major collaborative effort to develop the technology for complex wireless communication networks that can be set up in rapidly changing environments such as battlefields and emergency situations. Faculty in UCSC's Baskin School of Engineering will head a multidisciplinary team of scientists at seven major universities working on the Dynamic Ad-hoc Wireless Networks (DAWN) project. The project also includes researchers at UC Berkeley, UCLA, Stanford University, Massachusetts Institute of Technology (MIT), the University of Maryland, and the University of Illinois at Urbana-Champaign (UIUC). It is funded by a five-year grant from the U.S. Department of Defense that will provide an average of $1 million per year spread among the seven institutions. J. J. Garcia-Luna-Aceves, Jack Baskin Professor of Computer Engineering at UCSC and the principal investigator on the DAWN project, said the methods and protocols developed for this project will have widespread applications. The research is of particular interest to the U.S. Army to enable troops to deploy mobile communications networks on the battlefield. But such networks could also be used by emergency personnel in the aftermath of an earthquake or other disaster in which pre-existing communications infrastructure has been knocked out. In addition, mobile and adaptable wireless networking may find more commonplace applications in the increasingly wireless world of modern communications. "Even today, with the widespread use of wireless technology, little is understood about how wireless networks can scale up and become part of the Internet at large. 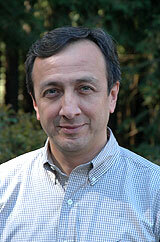 We really need to develop a science of wireless networking," Garcia-Luna-Aceves said. The DAWN project aims to establish the fundamental principles, tools, and methodologies needed to design reliable and efficient wireless networks. So far, the methods that have been applied in wireless networks have been derived from the wired world, Garcia-Luna-Aceves said. But ad-hoc wireless networks are complex systems with interactions and dynamics that do not occur in wired networks. An ad-hoc wireless network is a self-organizing system of wireless devices in which individual nodes may move randomly and organize themselves into an unpredictable and rapidly changing network. The impact of a wireless transmission is not confined to a stable set of point-to-point links, as in a wired network, but reaches any receiver within its range. Interference at a receiver is a complex function of the characteristics of the wireless devices and the terrain or physical environment in which they are operating. "We need a mathematical framework that will allow us to model the more complex world of the wireless environment. In the past, we have made many assumptions just to make the modeling tractable, but now we will be pushing the envelope," Garcia-Luna-Aceves said. Garcia-Luna-Aceves has been working in the area of wireless networking for many years and has led several successful projects to develop small-scale mobile wireless networks. The DAWN project is an interdisciplinary effort to advance this research to a larger scale. By developing an understanding of how large-scale wireless networks operate, the project will lay the foundation for greater accessibility to the Internet, Garcia-Luna-Aceves said. "For the Internet to become more pervasive, people need to have access wherever they are. Wireless networking will enable the Internet to be even more useful than it is today," he said. The DAWN team includes some of the top researchers in the field of networking, and Garcia-Luna-Aceves noted that UCSC's leadership of the project is indicative of the campus's stature in the field. "We are leading the best universities in the field on this project, and I think that's a recognition that UCSC is doing first-rate research in networking," Garcia-Luna-Aceves said. In addition to Garcia-Luna-Aceves, the UCSC faculty involved in the project include Katia Obraczka, associate professor of computer engineering, and Hamid Sadjadpour, assistant professor of electrical engineering. Other major contributors include Tony Ephremides at University of Maryland, Andrea Goldsmith at Stanford, Jennifer Hou and Nitin Vaidya at UIUC, Mario Gerla and Rajive Bagrodia at UCLA, Muriel Medard at MIT, and Pravin Varaiya at UC Berkeley. The DAWN grant is one of 33 research grants awarded this year under the Multidisciplinary University Research Initiative (MURI) program. The grant will provide support for 19 graduate students, including at least four at UCSC. Industry collaborations will provide additional support for students through summer internships.